A couple of years ago, shortly after Matty and I moved into our new house, our friends Stephen and Sarah came over for dinner. Since we were still getting settled in the new kitchen, they brought over all the fixings for a fantastic meal. 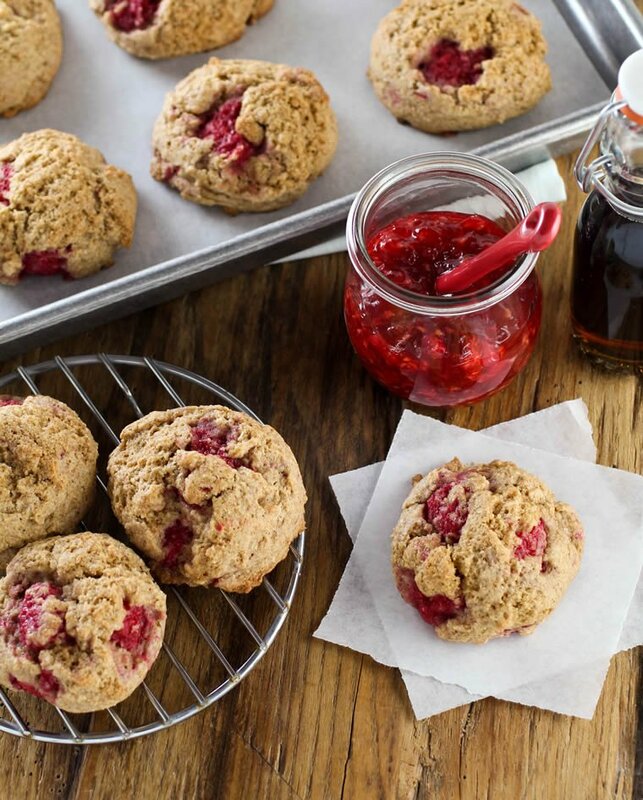 For dessert, Sarah whipped up a batch of these Vegan Raspberry Spelt Scones. They were delightful — moist and fluffy, a little chewy, with a sweet/tart punch from the raspberries. They immediately became a favorite recipe of ours. They’re as easy as mixing up a batch of cookies – and just as satisfying – but have the benefit of being low in sugar and 100% whole grain. They’re perfect for bringing to a holiday party… or any party, for that matter. Sarah passed along the recipe she uses, which I believe originally comes from Erin McKenna, owner of Babycakes NYC. I found it posted on the Fig & Sage blog, who mentioned that she, in turn, pulled it from an issue of Natural Health Magazine. I’ve tweaked it slightly, however: I use maple syrup instead of agave, as it’s unprocessed, and adds a rustic richness you don’t get with generically sweet agave. … though this recipe is definitely not gluten-free, as spelt is a type of wheat. These are moist and fluffy, a little chewy, with a sweet/tart punch from the raspberries. Don't worry if you don't have spelt flour handy, as whole wheat flour (preferably white whole wheat) will work just fine, too. Mix together dry ingredients in a medium bowl. Add coconut oil, maple syrup, and vanilla and stir until you have a thick batter. Add warm water and continue mixing. Gently fold in the raspberries until they're mixed evenly throughout the batter. 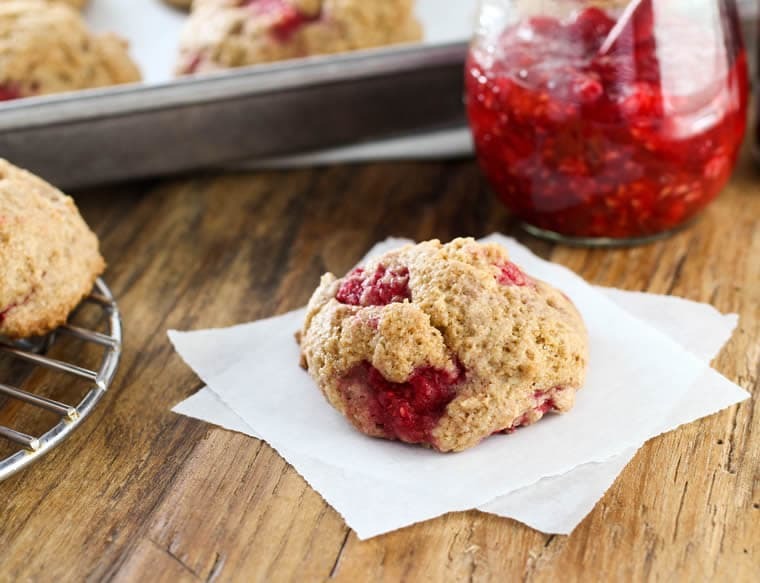 Line a baking sheet with parchment paper, and drop a dollop of batter for each scone-to-be. Leave room between each for them to spread, just like when making cookies. Brush the top of each with coconut oil. Bake for 14 minutes, rotating the sheet half-way through to ensure even cooking. When done, they should be golden and slightly firm. Let the scones stay on the sheet for 15 minutes, then transfer to a wire rack to finish cooling. These look positively scrumptious! Although I was wondering, seeing as they’re gluten-free, being made with only whole spelt flour, they don’t need anything to add elasticity to the dough? I’ve been gluten free for over a year now and I usually add a bit of xanthan gum to my recipes so that they don’t end up all crumbly and dry. Could xanthan gum be added in this caseor is it simply not necessary? Hi LouAnn! Do you have butter in the house? If you’re not vegan, I think butter would probably work just as well. Perfect Start to XMAS Morning!! Thanks for the inspiration! I was out of spelt, so used white whole wheat, and frozen mixed berries. Delicious with a cup tea.